Oh good! You’re still reading my articles! If I was a blogging kind of person, I suppose you could call these blogs. Whatever works for you. How was that for small talk? OK, back on track now. Event Schedules. This is an important part of planning your online event. Many people are used to a scheduled day or set of days with sessions scheduled to start at certain times along with allotted time for breaks, special gatherings and exhibits. At an in person conference you are almost restricted by a schedule because no one has figured out how to be in 2 places at 1 time. Enter the “online” event. Time is no longer your enemy (in most cases). There are 3 main ways to go about placing out or scheduling your event’s content. Live – This means you are streaming out the content (usually audio and some sort of video) to your attendees in real time as it is happening. This is common when an online event is running alongside an in person event. 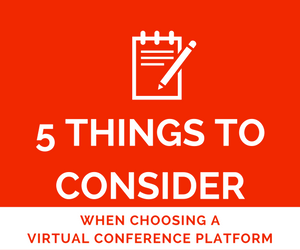 This is also a very common format for people who have done webinars with teleconferencing involved. Live is there for a few good reasons, but many people do it this way simply because they don’t realize there is a better way. Don’t get me wrong, live certainly has its place. I would say those places are running alongside a live in person event or where 2 way interaction drives the live session’s content…Like a call and response sort of scenario. However, as you’ll find if you continue to read this, there are some interesting ways to maximize your content and time by avoiding “Live”. Simulated Live – This is where there is a schedule for the event and content will be shown at a specific time, but the content has been pre-recorded. Think “like TV”. This is a favored delivery method because session content can be recorded and presented without the risks of “live” problems ruining the event. There are currently much more easily accessible technologies to help create your session in a non real-time project format than there are for content generation in a live stream scenario. You may say, “how do we get the interaction then?” “Good question!” I would say. Chat is a very common part of any online event. It allows attendees to interact with support staff, presenters, vendors, and even each other in a medium that almost everyone is familiar with. The beauty of pre-recorded sessions is that the presenter can be discussing his/her session with the viewers as his/her content is being played back. Rather than having to wait for questions until the end of the presentation which limits the amount of time that can be devoted to the viewers questions. Thus limiting the very interaction that you thought you could only get with a live event. On-Demand – Do you have a DVR? Do you love it? Why? (Besides fast forwarding the commercials). Because it allows you to watch what you want when you want to. Most of the world is headed this way. We are becoming accustomed to receiving our information when and how we want it. On-Demand events allow content to always be available to the attendee which allows them to say “Thank you Mr/Mrs Event planner”. Think about it. What if your event is 3 days long and an attendee can only attend 1 of those days. He really wants to participate but he can’t conform to YOUR schedule. Don’t lose him because of this, your event can conform to HIS schedule. On-Demand can also bolster your event as an added option. Some event planners charge for On-Demand, some use it as a value add and some go all out and do On-Demand only. Keep in mind that if you’re concerned about attendee interaction, On-Demand can be setup with email discussion systems that alert the presenter whenever a viewer has a comment or question. A popular option for Education is to have office hours with the presenter so that students can watch when they want and then gather together at a pre determined date and time to discuss. I will make a bold assertion and say that this is also the way of the future. It only makes sense as people’s schedules get busier and work/personal lines get blurred. This works for some forms of content and not for others. Remember, use the right tools for the job.